Of the four machines that took part (apart from a couple of D.H. 53's flying hors de concours) No. 2, the biplane designed and entered by Captain R. W. Reid and piloted by Captain Moody, of the "Quantas," was deleted early in the proceedings by getting into ДальшеMore>>> a down draught, making a forced landing and overturning in a ditch just outside the aerodrome. This machine was fitted with a Blackburne "Tomtit" engine, and was generally regarded as a very fine piece of work. 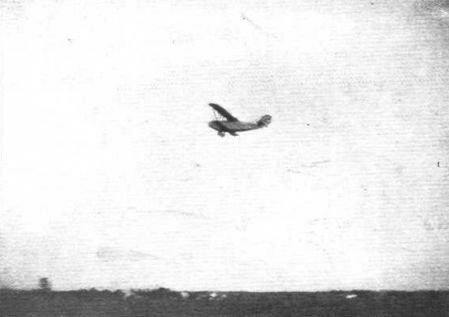 Our photograph does not give a very good idea of the machine, but it may be seen that the fuselage was of excellent streamline form, although perhaps somewhat "stumpy," and that the single-bay biplane wings had vee inter-plane struts, the lower plane being smaller in span and chord than the top plane. The Blackburne engine was mounted "upside down" after the fashion set by Mr. Shackleton with his A.N.E.C. monoplane. AUSTRALIAN LIGHT 'PLANES: No. 2, the Reid biplane, with Blackburne "Tomtit" engine, on her first and only flight.